The patented Sentinel Chamber is a specially designed container for monitoring the effect of treatments or ecological changes on important indicator organisms. The water and wastewater treatment Sentinel Chamber is designed to contain organisms that should be monitored to prevent health concerns. The chambers are placed in water or wastewater before treatment and recovered after treatment. 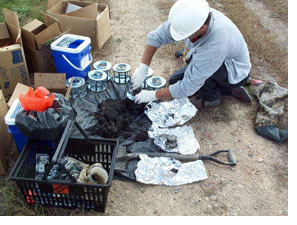 The organisms are then extracted from the chamber and their viability is tested. This simple system enables you to monitor the efficacy of treatments and provides an easy method for determining if the treatment is reducing pathogen viability. Water or biosolids from your plant can be placed in the chambers along with a predetermined number of indicator organisms. 1" X 1" Polycarbonate "Californian" Chamber, has US#400 (38 micron) stainless steel mesh on each end. "The Brewster" is our 2" wide by 1" in diameter polycarbonate chamber, with US#400 (38 micron) stainless steel mesh on each end, and a 3/4" opening on the side for loading semi-solid material or liquids. Custom made cages for housing the Sentinel Chamber are also available. Excelsior Sentinel, Inc. has developed a series of inexpensive containers that makes the recovery of Sentinel Chambers from large test systems easy. The Sentinel Chambers are resistant to most environmental extremes and have remained in soils and manure piles for up to six months without any observed detrimental effects on their integrity. Excelsior Sentinel, Inc. will gladly provide methods for the recovery of oocysts from the Sentinel Chamber. Excelsior Sentinel, Inc. does not perform viabiltiy assays on the organisms after field testing, but can refer clients to laboratories that do. 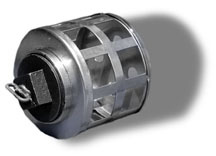  The Sentinel Chamber can be filled with oocysts in water or wastewater from the specific facility being tested so that the environmental conditions unique to that facility are replicated inside the Sentinel Chamber.  For testing laboratories, the Sentinel Chamber provides significant savings due to the elimination of tedious and expensive processing of large volumes in order to recover enough oocysts for viability testing.  The Sentinel Chamber provides a source of guaranteed viable oocysts on short notice (within 2 days of receipt of wastewater sample). It eliminates the need for collecting and preparing large volumes for shipment to the testing laboratory and allows for pinpoint testing of specific parts of the overall process.